The exploits of the old-time strongmen are legendary. In fact, such was their strength that many of their recorded lifts, such as Arthur Saxon’s ‘two hands anyhow’ of 448 pounds, still remain unbroken today. To achieve this Herculean strength, these men trained using a variety of different methods, many of which you would be hard pressed to find in the air-conditioned gymnasiums of today. Which is a shame, because a lot of these ‘lost’ exercises are extremely effective ways of building strength and explosive power. In this article I will outline a few of the training techniques which were employed by the old-time strongmen. A word of caution: a lot of these lifts require specialist knowledge and experience, so to avoid injury ensure you receive proper instruction before attempting them. Russian weightlifting champion Vasily Alexeev, one of the strongest men of all time, used a variety of unconventional training techniques to give himself the edge over his competition. One such technique was to wade out into the Don River in Mother Russia and practice his cleans in waist-deep water! Pros: resistance provided by the water helps develop explosive power. Cons: chance of drowning, wrinkled skin, Hepatitis. Lifting kegs and barrels was an extremely popular training method with the old-time strongmen. 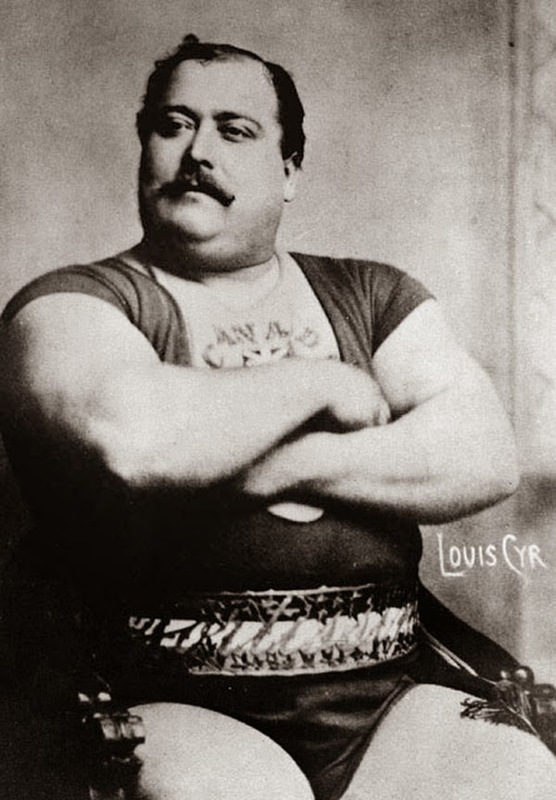 Louis Cyr, for example, could lift a 450 pound barrel to his chest with just the one hand! To make these barrel lifts all the more difficult, the barrels would be partially filled with liquid in order to make them unbalanced. What’s more, strongmen such as Arthur Saxon would also drink most of the contents of the keg while training, thus adding an extra dimension of difficulty! Many of the greatest old-time strongmen, such as Cyr and Saxon, incorporated a lot of ‘supporting’ exercises into their training regimes and public performances, which involved supporting a weight rather than actually lifting it. Such exercises comprised standing supports (such as holding a heavy barbell in the back squat position), overhead supports (holding a barbell aloft), and a leg press support (supporting a weight in the leg press position). Louis Cyr, for example, could support more than 4,000 pounds on his back! Two popular tests of strength back in the day were bending horseshoes and tearing up phonebooks. In addition to building character and mental toughness, both of these feats helped create incredible grip and wrist strength. Plus, could you think of a better party trick? These clubs were swung around thousands of years ago by Indian warriors and wrestlers to prepare for battle (hence the name). They were used primarily to build upper body strength in addition to stronger, more flexible joints. Indian clubs were popular in England in the 19th century, especially with military cadets, however their popularity waned in the twentieth century as organised sports became more popular. Rope climbing was a staple of the strongman training regime as it helped build upper body strength and a cast iron grip. In fact, in most early gymnasiums you would find huge thick ropes suspended from the ceiling. Old-time strongmen would climb and descended these ropes, which were often up to 30 feet long, several times a day. So, there we have it, 6 unconventional training techniques of the old-time strongmen. Ultimately, there is a lot we can learn from these old-school training techniques which can be applied to strength training today. If you have any thoughts on this article I’d love to hear from you – just leave me a comment below! Henry is a fitness junkie with a passion for heavy squats, distance running and Martial Arts. You can find him blogging over at GymTalk.